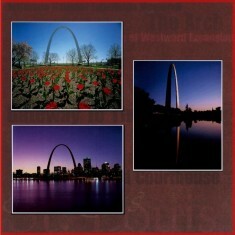 These St Louis Scrapbook pages of the Saint Louis Arch - Gateway to the West - use a kit and photos and post cards purchased from Museum Store in St. Louis in October 2009. These were purchased by a friend of mine who know that I have this scrapbook website. These layouts were done in digital format using the Heritage Makers system that can be seen at the Memory Book Architects site. These pages are also a good example of using purchased post cards and photos to complete your scrapbook layouts. These are such wonderful photos that mine paled in comparison. For all of these St Louis Scrapbook layouts, I scanned the papers that I received in the kit, uploaded the scanned images into the Heritage Makers system and used them as background images for my pages. 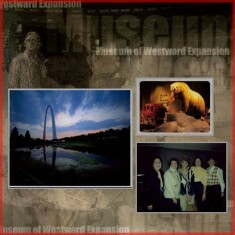 Also scanned were photos and post cards purchased at the Arch in 1999. 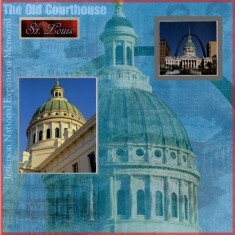 The large photo on the left shows The Old Courthouse building, the cast-iron Italian-Renaissance style dome, modeled after St. Peter's Basillica in Rome that was designed by William Rumbold. The photographer is Richard Sprengeler. The large photo on the right shows a unique mixture of the old and new make up of the Jefferson National Expansion Memorial. 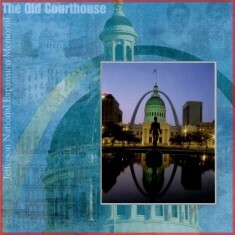 The Old Courthouse completed in 1962 and the Gateway Arch completed in 1965 commemorate the opening of the West. The photographer is Spectra Action. 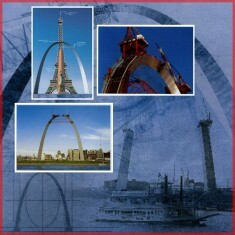 These St Louis Scrapbook pages of the Gateway Arch show the construction of the Arch. The purchased post cards used here show the Arch in comparision to the Eiffel Tower, the Washington Monument and the Statue of Liberty. As work neared its completion, an 80-ton stabilizing strut was installed between the two legs at the 530 foot level to provide support until the legs could be joined. Photographed by Jack Zehri. Before placement of the final piece, a gap only 2 feet wide remained. Jacks mounted on the top opened the gap to 8 feet by applying 500 tons of pressure. This allowed the last section to be inserted and clamped in place. Photographed by Jack Zehri. The first large photo on the left page shows the Arch at sunset and beautifully highlights the unique skyline of St Louis since the building of the Arch. Photographer Richard Sprengeler. 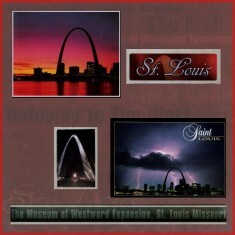 The post card that depicts the dramatic night time lightning display over the Gareway Arch and the St Louis skyline. Photographer Stuart West. The right layouts shows three more of the purchased photos. One photo shows the Luther Ely Smith Square with the Red Tulips in the forground with the Arch in the background. The square was named after the founding father of the memorial who first proposed the creation of the memorial in 1933. Photographer Jack Zehrt. The photo underneath shows the Gateway Arch from the river side of St Louis. Photographer Kurt Hosna. The third photo shows the elements of grace, beauty and strength as it rises elegantly from a forest of trees at the river's edge at sunset. Photographer Richarge Sprengeler. This last set of St Louis Scrapbook layouts shows two large photos. 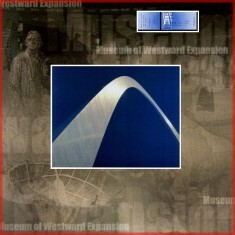 The left photo shows the Gateway Arch as the centerpiece of the 91 acre Jefferson National Expansion Memorial. This park of rolling wooded hills and reflection pools is in the heart of downtown St. Louis. 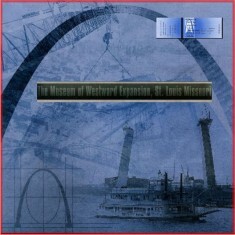 Every where one goes in the city, the Gateway Arch is a reference landmark. Photographer Jack Zehrt. The other photos were taken by me of the inside of the museum and a group of friends that I was with when I traveled to St Louis. The right single photo shows the bold design of the Arch makes it a fitting tribute to those who risked their lives to open the wilderness West of the Mississippi. 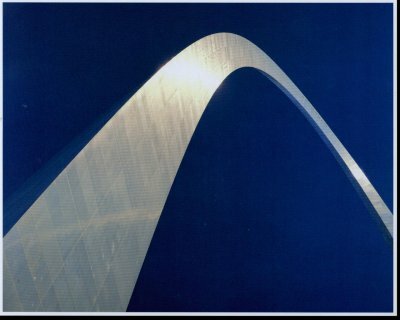 The Arch is an inverted weighted catenary curve. Photographer Richard Sprengeler.